2016 Corvette Stingray Coupe and Convertible Details - MacMulkin Corvette - 2nd Largest Corvette Dealer in the World! Three all-new, color-themed design packages – Twilight Blue, Spice Red and Jet Black Suede – lead the charge, offering custom-tailored appearances that elevate the Stingray’s presence on the street or track, while features such as an available front curb view parking camera and power-cinching latch for the coupe’s hatchback or convertible’s trunk enhance convenience – and add an extra measure protection. New smartphone projection technology on Corvette Stingray’s MyLink system displays content from Apple iPhone 5 or later models on the multicolor screen through the Apple CarPlay feature. Supported apps for the system include phone, messages, maps, music and compatible third-party apps. Magnetic Ride Control is available on Stingray models without the Z51 package. Corvette Stingray is offered in 1LT, 2LT and 3LT trim levels. The three new design packages offered on 2016 Stingray offer customers more choices for a tailored look and feel of their Corvette. Each gives the vehicle a distinctive, customized appearance that reflects the different roles the Corvette plays in different customers’ experiences – from high-performance to grand touring. Each is offered on Stingray 3LT coupe and convertible models with the following details. Magnetic Ride Control required on Stingray models without Z51. Magnetic Ride Control on Stingray models without Z51. Corvette Stingray’s provocative exterior styling is as functional as it is elegant. It makes a bold design statement that embraces the advanced technology of the car, while enhancing its overall performance in everything from the wind tunnel to the track. Lighting is a signature element of the Corvette Stingray’s design and reinforces its high-tech aesthetic. At the front, indirect white LED lamps form a distinctive daytime styling cue. They are set in black-chrome lamp housings with standard HID projector headlamps. The turn signals feature edge-lit amber LED lighting. The dual-element taillamps feature three-dimensional, sculpted lenses housing innovative indirect LED lighting. The state-of-the-art lighting uses hidden LED lamps that cast their light up from the bottom of the housing into a reverse reflector, creating an even glow. LED lamps are also used for the white backup lamps. The taillamps integrate functional aircraft-style air outlets for the available differential and transmission coolers. The Corvette Stingray convertible features a fully electronic top that can be lowered remotely using the key fob. The top can also be opened or closed on the go, at speeds of up to 30 mph (50 km/h). Its folding mechanism is all-new and enables the top to be lowered in 21 seconds. All Corvette Stingray models with the Z51 Performance Package feature integral coolers for the rear differential and transmission (the transmission cooler is also included with the optional automatic transmission). For coupe models, the air intakes are integrated on the rear quarter panels; and on convertible models, the air intakes are integrated into the underbody. Airflow through the differential and transmission heat exchangers exits through the aircraft-inspired taillamp vents and lower-rear fascia air outlets. The Z51 Performance Package also includes brake-cooling ducts, a unique rear spoiler and additional air deflectors for enhanced track capability. New FE2 Magnetic Ride Control on Stingray enables Z51 wheels and rear spoiler without the Z51 Performance Package. Exterior colors: Laguna Blue Tintcoat, Daytona Sunrise Orange Metallic, Corvette Racing Yellow Tintcoat, Arctic White, Blade Silver Metallic, Black, Shark Gray Metallic, Long Beach Red Metallic Tintcoat, Torch Red and Night Race Blue Metallic. The Corvette Stingray interior blends fine materials and craftsmanship with advanced technologies that contribute to a more connected and more engaging driving experience. Every feature and detail is designed to enhance the driver’s connection to the Corvette, starting with the fighter jet-inspired wraparound cockpit and continuing with supportive seats and high-definition, configurable screens. A comparatively small, 14.1-inch-diameter (360 mm) steering wheel – with a new flat-bottom design – fosters a more direct, immediate feel to directional inputs. The attention to the driver extends to the smallest details, including the flat, precise stitching on the steering wheel designed to provide a smooth, consistent feel. 3LT: GT seats with perforated Napa leather seating surfaces; Competition Sport seats with perforated Mulan leather seating surfaces; GT or Competition Sport seats with leather seating surfaces and sueded microfiber inserts. Also: leather-wrapped instrument panel and suede-wrapped upper trim. All models feature a fully-wrapped interior, where every surface is covered with premium, soft-touch materials. Available materials, depending on the trim level, include Napa leather, aluminum, carbon fiber and micro-suede. There’s even a micro-LED screen for the passenger’s climate control placed below the vent on the dash, away from the performance features on the instrument panel. Interior colors: Gray, Jet Black, Kalahari, Brownstone and Adrenaline Red. Apple CarPlay-supported apps include Phone, Messages, Maps, Music and compatible third-party apps. A full list of those apps can be found at Apple.com/ios/carplay. While development and testing is not yet complete, Android Auto compatibility may be available later in the 2016 model year. OnStar 4G LTE connectivity with Wi-Fi hotspot provides a mobile hub for drivers and passengers to stay connected. The hotspot is on whenever the vehicle is on and it comes with a three-month/three gigabyte data trial, after which the customer can purchase additional data. At the time of purchase, six months of OnStar Guidance includes all of OnStar’s advisor-based safety and security features, including Automatic Crash Response and Stolen Vehicle Assistance, as well as turn-by-turn navigation. Five years of OnStar Basic Plan includes RemoteLink Key Fob Services, allowing owners to remotely start and lock/unlock a car (if properly equipped), and activate the horn and lights from anywhere with a data connection. It also includes OnStar Vehicle Diagnostics which runs monthly checks of a vehicle’s engine, transmission, antilock brakes and more, and Dealer Maintenance Notification, which sends diagnostic report directly to a preferred dealer to make service scheduling simple. The Tour mode is the default setting for everyday driving; Weather mode is designed primarily for added confidence while driving in rain and snow; Eco mode is for achieving optimal fuel economy; Sport mode is for spirited road driving and Track mode is for track use. Performance Traction Management: Available in Track mode and offers five settings of torque reduction and brake intervention for track driving. The PDR system includes three major components, all seamlessly integrated into the Corvette Stingray’s interior. First is a high-definition camera, mounted within the windshield header trim, which records the driver’s point-of-view through the windshield. Audio is recorded via a dedicated microphone in the cabin. Second is a self-contained telemetry recorder, which uses a dedicated GPS receiver that operates at 5 hertz, or cycles per second – five times faster than the in-dash navigation system, which allows more precise positioning and corner traces. Finally, the system features a dedicated SD-card slot in the glove box for recording and transferring video and vehicle data (SD card not included). Recording time depends on the capacity of the memory card, but an 8-gigabyte card can record approximately 200 minutes, while a 32-GB card stores up to about 800 minutes – more than 13 hours of driving time. The video can be viewed on the Corvette Stingray’s 8-inch color touchscreen when the car is parked, or downloaded to a computer for further editing, and for sharing video via social media sites. For users who want a more in-depth understanding of their performance, the PDR vehicle data can be opened in the included “Cosworth Toolbox” software, which combines Cosworth’s professional-level motorsport data analysis with an easy-to-use graphic interface. Corvette Stingray coupe and convertible take advantage of lightweight materials, advanced manufacturing techniques and technology transfer from the Corvette Racing program to produce an ideal 50/50 weight balance and to deliver world-class power-to-weight ratios. The technologically advanced foundation is an aluminum frame structure so strong, no structural reinforcements are needed for the convertible model. The only changes are limited to accommodations for the folding top and repositioned safety belt mounts. The frame features main rails composed of five customized aluminum segments, including aluminum extrusions at each end, a center main rail section and hollow-cast nodes at the suspension interface points. Each segment’s gauge varies in thickness from 2mm to 11mm, tailored – along with the shape – to optimize the strength requirements for each frame section with minimal weight. 37 feet of laser welds, which join frame sections via a precise beam of high energy that minimizes heat beyond the weld area for improved structural accuracy. The frame’s strength and low weight are complemented by chassis elements also designed for low-mass strength, including hollow-cast aluminum front and rear cradles. Innovative use of materials also includes a standard carbon fiber hood on all Corvette Stingray models, and a carbon fiber roof panel on all coupes. In addition, underbody panels are created with carbon-nano composite technology, an advanced blend of traditional composite material and carbon fiber for reduced weight and improved strength. Fenders, doors, rear quarter panels and the rear hatch panel are made with light-density Sheet Molded Compound. The Corvette Stingray’s 455 horses are generated by the LT1 6.2L Small Block V-8 engine, which also produces 460 lb-ft of torque (624 Nm). Its performance comes from combining advanced technologies such as direct injection, Active Fuel Management (cylinder deactivation) and continuously variable valve timing with an advanced combustion system. Z51-equipped models include a dry-sump oiling system. The LT1 is backed by a choice of active, 2.75-inch-diameter exhaust systems. The standard system features a pair of butterfly valves that contribute to greater refinement at cruising speeds when the engine is operating in fuel-saving V-4 mode. The available performance variable-mode active exhaust system has two additional valves that open to a lower-restriction path through the mufflers. When open, these valves increase engine performance and produce a more powerful exhaust note – while also raising the engine’s output to 460 horsepower (343 kW) and 465 lb-ft of torque (630 Nm). The LT1 is offered with an all-new seven-speed manual transmission with Active Rev Matching. It incorporates rev-matching technology for upshifts and downshifts. This driver-selectable feature can be easily engaged or disengaged via paddles on the steering wheel. The seven-speed is used with a new dual-mass flywheel and dual-disc clutch, which deliver greater shift quality and feel through lower inertia. The transmission with the Z51 Performance Package includes specific close-ratio gearing for more aggressive driving. An available eight-speed paddle-shift automatic transmission, designed and built by GM, delivers world-class shift times that rival the best dual-clutch designs. Its availability makes Corvette Stingray one of the few sports cars to offer a conventional manual transmission and an eight-speed automatic. The Corvette Stingray’s chassis and suspension are designed to take advantage of the lighter, stiffer structure. Its rigidity allowed engineers to more precisely tune the suspension and steering for a more nimble and responsive driving experience. The components and their calibrations – from the brake size and damper rates to the steering system – are identical between coupes and convertible. 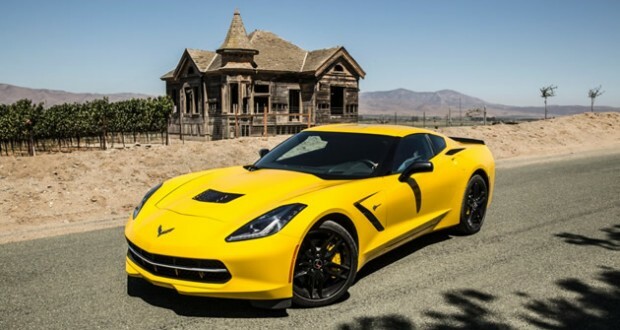 The Corvette Stingray rides on 18 x 8.5-inch front and 19 x 10-inch rear wheels, while models with the Z51 Performance Package roll on 19 x 8.5-inch front and 20 x 10-inch rear forged aluminum wheels – all shod with Michelin Pilot Super Sport run-flat tires developed specifically for the seventh-generation Corvette. As a result, the Corvette Stingray with the Z51 Performance Package is capable of 1.03g in cornering acceleration. All brake packages have fixed four-piston front and rear calipers that are stiffer for more even pad wear, reduced drag and improved modulation. The Corvette Stingray is built at GM’s Bowling Green, Ky., assembly plant.